Christians Debate: Was Jesus For Small Government? 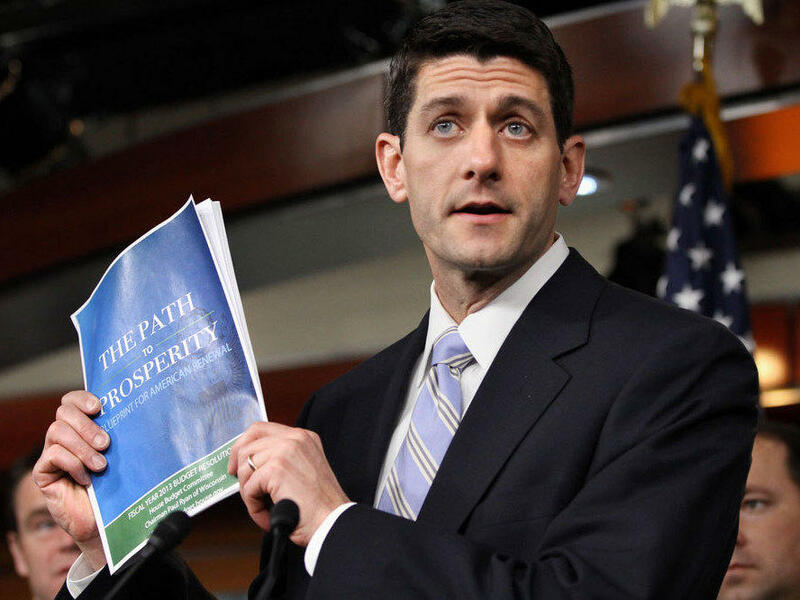 House Budget Committee Chairman Rep. Paul Ryan, R-Wis., with his 2012 budget plan. Ryan cites his Catholic faith in justifying his proposed cuts to social safety-net programs. What would Jesus do with the U.S. economy? That's a matter of fierce debate among Christians — with conservatives promoting a small-government Jesus and liberals seeing Jesus as an advocate for the poor. After the House passed its budget last month, liberal religious leaders said the Republican plan, which lowered taxes and cut services to the poor, was an affront to the Gospel — and particularly Jesus' command to care for the poor. Not so, says Wisconsin Republican Rep. Paul Ryan, who chairs the House Budget Committee. He told Christian Broadcasting Network last week that it was his Catholic faith that helped shape the budget plan. In his view, the Catholic principle of subsidiarity suggests the government should have little role in helping the poor. But Stephen Schneck, a political scientist at Catholic University, says he thinks Ryan is "completely missing the boat and not understanding the real heart, the real core, of Catholic social teaching." Peter Montgomery at People for the American Way says conservative evangelicals have been arguing for years that the Bible favors a free-market system. But since President Obama was elected, he says, they have shifted into high gear. "They are finding biblical justification for opposition to progressive taxation, opposition to unions and collective bargaining, opposition to the minimum wage, opposition even to social welfare spending and Social Security," he says. Because, in their view, he says, God intends the government to have a minimal role in society. You hear echoes of that from megachurch pastor Rick Warren, who was asked about the budget recently on ABC's This Week. "The primary purpose of government is to keep the peace, protect the citizens, provide opportunity," Warren said. "And when we start getting into all kinds of other things, I think we invite greater control. And I'm fundamentally about freedom." Evangelicals cite the book of Romans, which is one of only a few places in the New Testament that refer to civil government. Then there's the conservative resistance to taxation, which some say violates the Eighth Commandment: "Thou shalt not steal." Richard Land at the Southern Baptist Convention says of course Jesus paid his taxes and advised followers to do the same. But, he says, "the Bible tells us that socialism and neosocialism never worked. Confiscatory tax rates never work." The Bible never mentions socialism, obviously, but Land says the whole of Scripture says that people are sinful and selfish and, therefore, "people aren't going to work very hard and very productively unless they get to keep a substantial portion of that which they make for them and for their families." Does The Bible Promote Capitalism? For other religious conservatives, the Bible is a blueprint for robust capitalism. Recently, on his radio program WallBuilders, David Barton and a guest discussed Jesus' parable of the vineyard owner. In it, the owner pays the worker he hires at the end of the day the same wage as he pays the one who begins work in the morning. Many theologians have long interpreted this as God's grace being available right up to the last minute, but Barton sees the parable as a bar to collective bargaining. "Where were unions in all this? The contract is between an employer and an employee. It's not between a group," Barton said. "He went out and hired individually the guys he wanted to work." Schneck says many Christians would not recognize this Gospel — and he says there are more biblical verses about feeding the hungry and taking care of the least fortunate. Schneck agrees that the Bible encourages initiative and hard work. But he says theologians through the ages have said there must be a balance. "Pope after pope after pope argued that we're called to be more than market creatures. We're called, in fact, to always bear in mind the common good and our responsibilities to others," he says. But we can probably expect both parties to claim Jesus as their favorite economist in the months to come. When trying to solve a problem, many Christians ask themselves: What would Jesus do? Well, that question is now at the center of a fierce debate about the economy, with conservatives promoting a small government Jesus, and liberals seeing Jesus as an advocate of more programs to help the poor. BARBARA BRADLEY HAGERTY, BYLINE: After the House passed its budget last month, liberal religious leaders said the Republican plan - which lowered taxes and cut services to the poor - was an affront to the Gospel and especially Jesus' command to care for the poor. Not so, says Wisconsin Republican Paul Ryan, who chairs the House Budget Committee. He recently told Christian Broadcasting Network that it was his Catholic faith that helped shape the budget plan. In his view, the Catholic principle of subsidiarity suggests that government should have little role in helping the poor. REPRESENTATIVE PAUL RYAN: Through our civic organizations, through our churches, through our charities, through all of our different groups where we interact with people as a community, that's how we advance the common good. HAGERTY: The best thing that government can do, he said, is get out of the way. STEPHEN SCHNECK: I think that he's completely missing the boat and not understanding the real heart, the real core, of Catholic social teaching. SCHNECK: But charities and individuals and churches can't do it all. When charities are already stretched to their limit, Catholic social teaching expects the state to step up and to fill that gap. HAGERTY: Peter Montgomery at People for the American Way says conservative evangelicals have been arguing for years that the Bible favors a free market system. But since Barack Obama was elected, he says, they've shifted into high gear. PETER MONTGOMERY: They are finding biblical justification for opposition to progressive taxation, opposition to unions and collective bargaining, opposition to the minimum wage, opposition even to social welfare spending and Social Security. HAGERTY: Because, in their view, he says, God intends the government to have a minimal role in society. You heard echoes of that from megachurch pastor Rick Warren, who was asked about the budget recently on ABC's "This Week." RICHARD LAND: The Bible tells us that socialism and neo-socialism never worked. Confiscatory tax rates never work. LAND: People aren't going to work very hard and very productively unless they get to keep a substantial portion of that which they make for them and for their families. HAGERTY: For other religious conservatives, the Bible is a blueprint for robust capitalism. Recently, on his radio program, "Wallbuilders," David Barton and a guest discussed Jesus' parable of the vineyard owner. In it, the owner pays the worker he hires at the end of the day the same wage as he pays the one who begins work in the morning. Many theologians have long interpreted this as God's grace being available right up to the last minute. But Barton sees the parable as a bar to collective bargaining. DAVID BARTON: Where were unions in all this? The contract is between an employer and an employee. It's not between a group. He went out and hired individually the guys he wanted to work. HAGERTY: Stephen Schneck at Catholic University says many Christians would not recognize this Gospel, and he says there are more biblical verses about feeding the hungry and taking care the least of these. Schneck agrees that the Bible encourages initiative and hard work. But he says theologians through the ages have said there must be a balance. SCHNECK: Pope after pope after pope argued that we're called to be more than market creatures; we're called, in fact, to always bear in mind the common good and our responsibilities to others. HAGERTY: We can probably expect both parties to claim Jesus as their favorite economist in the months to come. Barbara Bradley Hagerty, NPR News. Transcript provided by NPR, Copyright NPR.